“Tan Khao Ma Rue Yung?” asks our cooking instructor, as she holds up ginger root, also known as khing in Thai, its sharp and slightly tangy scent awakening my sense of smell. We are standing in a Chiang Mai market choosing fresh ingredients for the day, and she has just asked us if we have eaten yet. Even if I had, the different aromas of fresh vegetables and salty meats mix with pungent spices, making my stomach growl. The smell of fish, just caught this morning, is usually enough to make me lose my appetite, but not today. 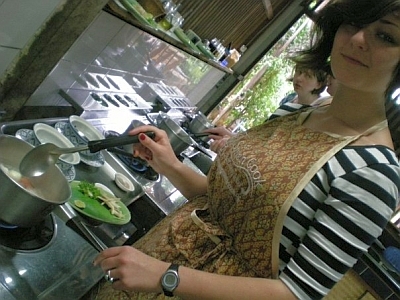 My friend Jenny and I have decided to take a Thai cooking class to learn more about Thai culture through food. We have chosen the instruction company Smart Cook and are both extremely excited, and hungry, for the day. Our instructor, a thin Thai woman with a big smile and loud voice, leads us to another stall and picks up something that appears to be a cross between a yellow tree branch and a giant french fry. We continue to walk around the market, taking in the unfamiliar sights, sounds and smells, as we are used to buying our produce from big name supermarkets. Of course, the foods Jenny and I usually consume at home undoubtedly contain pesticides, growth hormones and various other toxins. Everything here is freshly grown and free range. Our shopping list includes a variety of items: Shrimp paste, a mixture with a strong, salty redolence derived from dried shrimp; Thai garlic, which is sweeter than the Western variety; juicy papaya; protein-rich chicken; and tiny green chilies, the spiciest kind, are all part of our purchase. When we are finished and it is time to go over to the cooking school, I am confident we have visited every stall in the market at least once. Our classroom is outdoors, which I find to be refreshing and energizing as it is a sunny day in Chiang Mai. After each dish, we will be lead to a dining room where tables are set up with cushions to kneel on while we enjoy the food we have prepared. The first dish of the day is Phat Thai. We put on our aprons and are handed knives. We cut up onion and mix it with bean sprouts. Chopping garlic must also be done, which proves to be quite fun as we must first peel it and use the flat blade of our knives to smash it open by pressing the knife with the palm of our hands. Moving over to the stove area, we find giant woks set up for our cooking pleasure. As I begin by frying bits of tofu and adding a the garlic that I had chopped myself, I picture my dad cooking at our home in New York. He always seemed to know exactly which spices to add to a meal to liven it up, or which herbs would pair best with what ingredients. I knew he would be proud of me at this moment. Once all of the ingredients have been added to the wok and thoroughly cooked, I pour the contents onto a plate, adding chili powder, peanuts, and lime juice to enhance the flavor. Looking down at my masterpiece, I pull out my camera and take a picture. Jenny and I head over to the dining area and begin eating. The Phat Thai is so delicious that I cannot believe that I actually cooked this myself. Our instructor tells us a bit about traditional communal eating in Thailand. For our next course we make green curry with rice. Being a big fan of curry, I am excited to have the authentic kind. For this dish, we make a paste by pounding together different ingredients in a mortar. Peppercorns to infuse the intensity and flavors of the meal, coriander seeds, which aid digestion as well as migraines, and cumin seeds, with their nutty and peppery flavor are mashed together. A myriad other herbs and spices are blended and mixed in, including tiny green chilies. We add shrimp paste and pound the mixture, then add it to rice. And, as we kneel down to eat our works of art, the spicy scent of green curry enticing my nostrils and making my stomach growl, I forget that only 25 minutes ago I had eaten a dish of Phat Thai. The first bite is seductively hot, burning my mouth and causing my body to tingle a bit, while still beckoning me to eat more. It is addicting, and I can’t seem to stop spooning the delicious concoction into my mouth, until suddenly, something isn’t right. The instructor looks at me with wide eyes. “Let me grab you more water and some sticky rice,” she says, jumping up to grab a pitcher. The chillies are just added to flavor the dish but are really not meant to be swallowed themselves. I learn this the hard way. My eyes fill with tears and as soon as the pitcher of water is set in front of me I begin chugging. As I continue to gulp down the liquid, swishing it around in my mouth hoping to extinguish the flame the tiny green chili has ignited, I learn another lesson in Thai culture: They can really handle spice! My mouth begins to feel only somewhat like a fire had erupted in it when we begin to prepare the next meal: Tom Yam Kung, which is a hot and sour soup with prawns. For this dish we once again prepare our ingredients before we cook. We slice up lemon grass, the sweet citrusy smelling plant that acts as an anti-inflammatory as well as all-natural acne medication, kaffir lime leaves, which will blend with the lemon grass to give the soup an essence of lemon, and straw mushrooms, a mild flavored vegetable that can help lower cholesterol as well as treat cancer. After adding the remainder of the ingredients, adding them to large pot to boil, and then seasoning, we are set to eat. 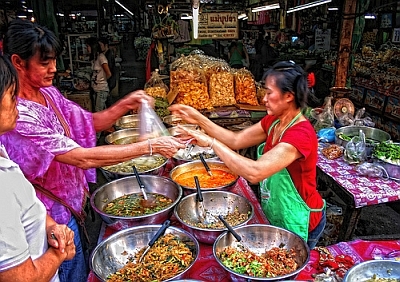 We learn that what makes Thai cuisine so special is not only its health benefits, but also the combination of tastes it incorporates, such as sweet, salty, sour, spicy, and bitter. After one bite of the Tom Yam Kung, I can tell why this is such a popular dish. 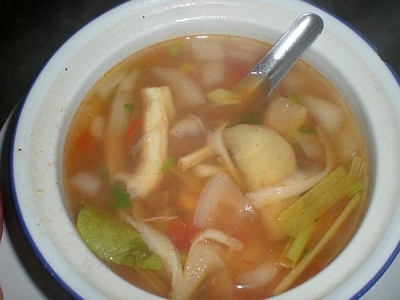 Due to the array of herbs and spices blended together in the soup, every taste is present. Since my mouth is now fully recovered, I welcome the hint of heat from the chili, the salty flavor from the fish sauce, the sweet taste of sugar, and the sour addition of the lemon. A literal melting pot is happening in my mouth at that very moment, and I am happy to be the host. For our last dish, we create something cold and refreshing, Som Tam, which is a papaya salad. Although this dish is technically a salad, I was reminded that we are in Thailand, and to expect flavors of sweet, sour, salty and spicy to be present in the meal. First, Jenny and I pound garlic, a natural antibiotic with a spicy tang, and chili in a mortar followed by Chinese long bean, a chewy and hearty vegetable containing many antioxidants and heart-healthy benefits. 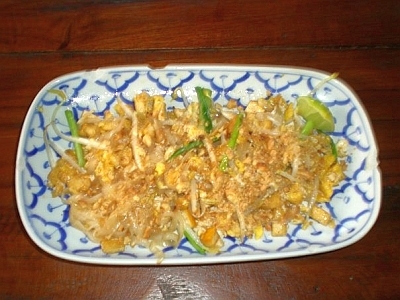 Other ingredients, such as palm sugar, fish sauce, and lime juice, are added, and the salad is topped with papaya. I also toss in some peanuts, which is a common addition to Som Tam. Jenny and I kneel down at the dining table for our last time. Back home, I would not have thought to combine spice with fruit, but in this dish it seems to work. While I find it odd to end the course with a salad, I love the fact that there are no rules here as to when something should be eaten. At one moment I begin to sweat from the chili, while the next I am revitalized by the papaya. It is both confusing and welcomed. We finish our meal and get up to wai, a common bow-type gesture, the instructor. Not only has she helped me enjoy delicious Thai cuisine while helping me realize my own cooking abilities, she has taught me a lot about the culture of Thailand through cuisine, and for this I am forever grateful. Jessica, a New York native, is a world traveler who is always looking for a new adventure. She stays active through dance, hiking and cycling, and loves nothing more than her backpack. Follow her travels around the world and the Big Apple on her blog at Jessieonajourney.com.